We’d love your help. Let us know what’s wrong with this preview of Girl vs Ghost by Kate McMurry. Isabel Lindley doesn’t believe in magic, but her best friend is obsessed with witchcraft. Strictly as a favor, Isabel agrees to help with a spell and is shocked when the ghost of a teenage boy splat-lands in her bedroom. Her friend is thrilled—even though only Isabel can see or hear the ghost Girl vs Ghost is a young-adult, paranormal, romantic comedy suitable for all ages. To ask other readers questions about Girl vs Ghost, please sign up. This book is filled with lots of humor as promised by the author, some very interesting observations made by the characters that will leave the reader thinking hard about what is going on at that point in the story and most of all a unique all-it's-own flavor that leaves you satisfied at the end while still wanting to read on and have more adventures with the girls! Not only is this a quick and easy read but it is one that will make you smile. Will Isabel be able to release the young man's ghost from his limbo and help him discover who he is and how he died? Will Tripp's continued use of magic cause more harm than good? Want the answers grab a copy today! I have to disclose that this book was a Kindle review copy submitted to me by the author for an honest review and that there is no other compensation from her or the publisher except for the review copy and my reading pleasure and enjoyment of the characters depicted in the story. I received this from the author for a review. I did give this book a chance, and got about halfway through until I gave up. I can see where the authors were trying to go with this story, but I have to say, I didn’t feel anything, I wasn’t emotionally connected, I found the characters annoying instead of quirky, and the plot has been done to death. It just saddens me that I have to give this review, because I promised I would. This could have been so much than it was. Girls (one of which is the gi I received this from the author for a review. I did give this book a chance, and got about halfway through until I gave up. I can see where the authors were trying to go with this story, but I have to say, I didn’t feel anything, I wasn’t emotionally connected, I found the characters annoying instead of quirky, and the plot has been done to death. It just saddens me that I have to give this review, because I promised I would. This could have been so much than it was. Girls (one of which is the girl with abilities who insists she’s normal normal normal) play around with forces they don’t understand. Girls accidentally open door to spirit world/summon ghost of teenage boy. Girls try to banish ghost with no success. Romantic comedy with paranormal hijinks ensues. By the end of the third chapter I was wondering where the laugh track was, because this felt very much like a paranormal romantic sitcom more than anything else. I found the art in between chapters needless and annoying, and it took away from the book more than it gave. This story has been done to death (or rather, this plot), and I just could not connect on any level. I found the characters repeating themselves several times throughout the book. This was too easy a read with the female characters bumbling whenever it was their turn in the spotlight. There were no teeth to this book, and by now, I expect any kind of paranormal plot to have some sort of teeth. It had no hook. So many improvements could have been made – the girl who insists she’s normal? She could have had some kind of issue in her past that would make her be so steadfast as to stick to those beliefs instead of just being a contrast to her fellow protagonist, who’s all over the wacky magical stuff. The boy could have been some kind of deviant or knave of some sort with his own issues to sort out. There was nothing to solve, in the grander scheme of things, aside of getting the ghost out of their lives. That’s not enough to keep me interested. I’ve been taught that when writing a book, the plot must have an arc that comes to a climax and then a resolution. I saw the plot. I didn’t see the arc, climax, nor the resolution. The words felt empty and forced. In short, I don’t think I’ll be reading the rest of this series. It felt too much like so much of what’s already been published by the big houses. It’s just disappointing to see something promising not live up to its potential. These are just the kinds of books I like—feisty female main character, just enough supernatural to keep things spooky and a storyline with a mystery I can really sink my teeth into. Too often, though, many of these books make big promises and then fall short-undeveloped characters, unbelievable plot, trite or rehashed storylines. This one, however, was a delightful surprise. Right from the start, I really liked the main character, Isabel, and was drawn into the story right away. Isabel is a reluc These are just the kinds of books I like—feisty female main character, just enough supernatural to keep things spooky and a storyline with a mystery I can really sink my teeth into. Too often, though, many of these books make big promises and then fall short-undeveloped characters, unbelievable plot, trite or rehashed storylines. This one, however, was a delightful surprise. Right from the start, I really liked the main character, Isabel, and was drawn into the story right away. Isabel is a reluctant participant in her friend Tripp’s hobbies, especially the newest one involving magic. When a sleepover turned séance goes dreadfully wrong, Isabel is shocked when a young boy falls from her ceiling. That shock turns to horror when she discovers the boy is actually a ghost. After that, things goes from bad to worse as Isabel learns he is somehow tied to her and the only way she can get rid of him is to help him discover the circumstances surrounding his death. Isabel was funny with just the right amount of sass—I had no trouble believing in her or her motivations or actions. I felt as if I were living the story through her and would have reacted the exact same way. The other characters in the book were just as believable and delightful. Tripp, Isabel’s bff, is just the kind of person I would want to hang out with—funny, interesting and doesn’t back down from a challenge. I hope she plays more of a role in another book. Tripp is strong enough to carry her own story. What I liked most of all about the story was the storyline. This genre of paranormal and paranormal romance has some real duds with most books just rehashing the same old plot over and over again. This one had something new and that’s what kept me going, kept me interested until the last page. I really didn’t know and couldn’t predict what was going to happen next. I loved the humor; felt the frustrations; liked the flirting; and was disappointed when the story ended! Overall, a great read and a series I intend to follow. Way Cute! I was hooked once I started reading this book! The book starts off with 2 friends, Isabel and Tripp playing around one Friday night. Tripp tries to do a summoning and lo and behold - a strange teenage boy falls from the sky and lands in the circle of salt right in the middle of Isabel's bedroom! When Isabel stands up to defend herself, she finds out that Trip Way Cute! I was hooked once I started reading this book! When Isabel stands up to defend herself, she finds out that Tripp has no idea who Isabel is talking about. But Isabel can see and hear this stranger. And no one knows why. Isabel and Tripp decide to go to Tripp's grandmother whom happens to own a witchcraft shop, and ask her for help. When Alora (Tripp's Grandmother) begins her own summonsing for an Angel to take this boy towards the light - we learn that it is not his time.. This boy (Marc) has a quest he needs to conquer, and being tied to Isabel (literally with a 5 foot long orange rope) because Isabel was suppose to be there to help him. This book was way cute in many ways - When Marc learns there is a lot more to Isabel's life then the furry she directs at him constantly. Marc trying to help her by fighing the "low spirits" (those were spooky) and of course Tripp.. Her personality was just awesome! Isabel and Tripp try their best to help out Marc with learning about his life and death. To try to help him finish his quest, but it seems like everything is against them. I really enjoyed reading this book. It had a lot of twists to it to keep you guessing how Marc died, and what's going to happen next. Isabel Lindley was only doing her friend Tripp a favor when they were doing a spell in her bedroom. She really didn't believe in magic. She certainly was surprised when a teenage boy lands on her floor. Isabel is not happy, Tripp is, even though she can't actually see him, and Isabel is the only one that can. Isabel does not want to take on the responsibility of this boy who doesn't know his name, when or how he died, and why he is tied to Isabel by a psychic chain. The only way to get rid of hi Isabel Lindley was only doing her friend Tripp a favor when they were doing a spell in her bedroom. She really didn't believe in magic. She certainly was surprised when a teenage boy lands on her floor. Isabel is not happy, Tripp is, even though she can't actually see him, and Isabel is the only one that can. Isabel does not want to take on the responsibility of this boy who doesn't know his name, when or how he died, and why he is tied to Isabel by a psychic chain. The only way to get rid of him she realizes is to figure out about his life, and then he can move on. She wants him gone. Isabel is the ordinary teenage girl. Wears t-shirts and jeans and doesn't believe in magic. I really liked her and her support for her best friend was how friends should be. Tripp was also a super likable character, she was different and a very entertaining. Marc was a mystery, it would be hard not knowing who you are, finding out you are dead and not knowing how it happened, seriously tough. I enjoyed finding out all the mystery surrounding Marc and Isabel and Tripp experience it with him. Girl vs. Ghost was funny, and entertaining! The art done inside and on the cover of the book were done by one of the authors, Marie August. The pictures were definitely a a great addition to the book! Isabel always gets pulled into her best friend's newest hobbies - this time it's witchcraft and spells read from a powerful spellbook. What Isabel didn't expect was to be tethered to a ghost only she can see and hear. Now she and Tripp have to figure out what happened to the ghost and unravel the tie between them! I really liked the characters - Isabel's shyness spiced with sass and Tripp's bold and brassy nature. Even the supporting characters were well defined which gave even more depth to the Isabel always gets pulled into her best friend's newest hobbies - this time it's witchcraft and spells read from a powerful spellbook. What Isabel didn't expect was to be tethered to a ghost only she can see and hear. Now she and Tripp have to figure out what happened to the ghost and unravel the tie between them! I really liked the characters - Isabel's shyness spiced with sass and Tripp's bold and brassy nature. Even the supporting characters were well defined which gave even more depth to the story. The plot was fantastic and unpredictable - lots of hair raising action, spookiness, comedy, and a touch of romance. I also greatly enjoyed the illustrations that accompanied the story. I was hooked from the first few pages and I wasn't disappointed! I am definitely looking forward to the next books in this trilogy! Well done, Ms. McMurry and Ms. August!! The premise is good, the writing is easy on the brain, and the story is fast paced. Isabel Lindley is a sixteen-year-old girl who's very, very pretty, but a complete nerd. She doesn't want to skate by in life on her looks. She wants to be a doctor someday, which is an enormous project. Because of that, she doesn't waste time on typical high school stuff, most especially dating. Partly because she's too focused on her big life plan to get sidetracked by a guy, but mostly because she's burned out on males in general because her dad deserted her and her mom years ago. She probably wouldn't do anything for fun at all if not for her wacky friend, Tripp. They've been BFF's since grade school, and Tripp is the kind of girl who has dozens of interests. Because of her, Isabel has experienced lots of things she might not have otherwise, and many of them she's actually enjoyed, but this latest nutty hobby of Tripp's is boring Isabel to tears. Tripp has suddenly decided she's a witch! Unfortunately for Isabel, it turns out that Tripp wasn't just bragging when she claimed to have magical powers, because a spell she dragged Isabel into helping her with yanks the spirit of a dead teenage boy into Isabel's bedroom. That's the setup for the story, and it takes off from there. There's never a dull moment throughout the whole thing, and the ending is just so clever. It took me completely by surprise, and in a good way in that I believe it. It made sense. I'm a huge fan of adult romance novels, and over the years I've read multiple romances with a ghost hero, but never one that ended like this. Very inventive and unique. Isabel and Tripp are a really fun pairing. Talk about your odd couple! Best friends are a real staple in young adult novels (I've read a lot of them because I have a teenage daughter), but I've rarely seen one as interesting as Tripp. Marc, the ghost boy, is a great love interest because Isabel doesn't immediately drool all over him (which often happens in adult romance novels and pretty often, too, in YA romances right after the hero and heroine meet). I love romances where the couple-to-be starts out at cross purposes, even almost enemies, with lots of witty sniping. That's sure the case here. Isabel and Marc have plenty of reasons to be upset with each other, and they make no bones about letting each other know it. Imagine if you were tied to a complete stranger (though a really, really cute one!) by some kind of spiritual chain that's only about five feet long. That could get really frustrating, really fast, and it sure does for these two. Give the book a try and find out how they deal with it! I'm looking forward to the next two books in the series. My daughter gave me this book to read. She heard about it at an anime convention (all I know is the kids go there and dress up in costumes--they have a ball). She told me about the website for this series which you can link to under the author's profile and insisted I go look at it. This book is written by a mother and daughter team, and the daughter, Marie August, is an artist. She did this amazing comic of the first chapter. Isabel has no interest in magic, just like she hasn't been too interested in her best friend Tripp's past obsessions. Like in the past, though, Isabel supports her, because that's what friends do, even if they do whine about it a little. Tripp performs a summoning spell and all of a sudden things are going crazy. There's a hot, male ghost who can't go more than five feet away from Isabel, who is also the only one who can see or hear him. Isabel just wants him to go away, he just wants to figure Isabel has no interest in magic, just like she hasn't been too interested in her best friend Tripp's past obsessions. Like in the past, though, Isabel supports her, because that's what friends do, even if they do whine about it a little. Tripp performs a summoning spell and all of a sudden things are going crazy. There's a hot, male ghost who can't go more than five feet away from Isabel, who is also the only one who can see or hear him. Isabel just wants him to go away, he just wants to figure out who he is was, and Tripp just wants to do more magic. This is a recipe for trouble. Girl vs. Ghost has some weaknesses, the most blatant of which is the cover art and the images between the chapters. While on some level I do think that one shouldn't judge books by their covers too much, I definitely do. Because of the cover art, I would not have picked this book up in the store. I occasionally found myself a bit confused by the changes of perspective, as the tale switches between Tripp and Isabel. Probably, were I to write this, I would have switched off at chapters or at least indicated whose section it was. Some other things clearly felt like setup, but did not come up again in this book, making them a bit out of place (see: demons at the school, ghost powers). Also, Finnegan's (Irish ghost) speaking annoyed me; this is a pet peeve, as I just cannot stand when characters are written in accents (a word here and there is fine, but let the reader do most of it in their head, please!). All of that said, Girl vs. Ghost is definitely better than quite a few of the YA books I've read from well-respected publishers (such as Hereafter or the House of Night books by another mother/daughter writing team). And, should I happen across the sequel at some point, I would certainly be willing to give it a shot to see if it's better; I like the characters enough to be curious about what will become of them. So if you would like a quick, easy read and to give some new authors a chance, pick up the Kindle version for only 99 cents! 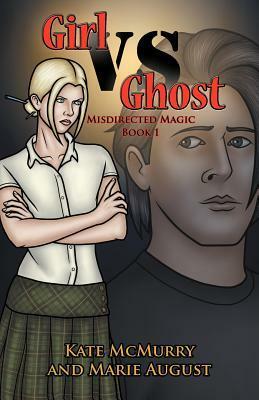 Isabel and Tripp are in for a surprise when a spell goes wrong and a ghost ends up tied, literally, to Isabel. Girl vs. Ghost is the first in a trilogy of books by the mother/daughter team, Kate McMurry and Marie August. The story follows Isabel, Tripp and their newly acquired ghost as they unravel the mystery of the ghost, where he came from and what he wants. I thought the story was fast paced - but well paced. Isabel and Tripp were fun together, though, I’m not entirely sure how Isabel puts u Isabel and Tripp are in for a surprise when a spell goes wrong and a ghost ends up tied, literally, to Isabel. I thought the story was fast paced - but well paced. Isabel and Tripp were fun together, though, I’m not entirely sure how Isabel puts up with Tripp! She’s quite a character. It’s written from multiple perspectives, however, it’s easy to pick up on whose point of view you’re reading. Sometimes, as many characters share their view of certain scenes, it did get a bit dizzying, but nothing overbearing. Isabel Lindley has always followed her best friend, Tripp, whenever Tripp found a new interest. But when Tripp's interest in witchcraft ends up giving Isabel a ghost of her own, she just wants out. But it doesn't look like things are going to be too easy - until she, Tripp and the Ghost Boy can figure out who he is and then help him go to the Light. Or something. This was a book that I won through the Goodreads First Reads giveaways and, thus far, it has become my favorite read of the almost 30 b Isabel Lindley has always followed her best friend, Tripp, whenever Tripp found a new interest. But when Tripp's interest in witchcraft ends up giving Isabel a ghost of her own, she just wants out. But it doesn't look like things are going to be too easy - until she, Tripp and the Ghost Boy can figure out who he is and then help him go to the Light. Or something. This was a book that I won through the Goodreads First Reads giveaways and, thus far, it has become my favorite read of the almost 30 books I've received. (Ok, so it's only the third one that I've read, but I really enjoyed it.) The authors are able to mix just the right amount of humor, paranormal and teenaged-reality into the book that it had me not wanting to close the covers until I'd finished it. Each of the four main characters (Isabel, Tripp, Marc - the "ghost boy" and Parker, Tripp's nemesis) are people I could easily imagine having been in my high school. They are a bit on the stereo-typical side - the weird girl with the wild hair, the serious, driven geek, the haughty rich boy and the gorgeous latino boy. But they characters seemed to work well together and made me anxious to read more. I could also have seen myself being friends with a couple of girls like Isabel and Tripp when I was in school. I loved the sniping between Marc and Isabel throughout, with them only realizing at the end that maybe they don't want to be separated from one another. And then wondering if it was too late. The story kept a good pace through-out, none of it seeming to drag anywhere. The authors brought the reader along, teasing out bits and pieces of what happened to Marc and why and, in the end, slammed them with something they probably hadn't seen coming (at least, I didn't). I'll admit that I was having flashbacks to the Charmed episode, "Dead Man Dating", thinking that Isabel was going to fall in love with a ghost that would have to leave her. Instead, I was very satisfied to read the ending. The paranormal portions weren't too spooky, though the things on the backs of the students at the school were a bit freaky (basically, ghosts that hadn't crossed over but instead stayed and became bitter, bringing out the worst in the people they latch on to). I'm far from an expert in witchcraft (much of what I know is media based) but things seemed plausible. And the reason for Parker and Tripp's spellings messing each other up seemed like a wonderful way to draw everyone into this sticky wicket. It was a great book! This book opens up beginning with Isabel and her best friend Tripp doing a spell. (witchcraft) Tripp does a spell making a ghost named Marc(aka Marco) appear in the room. He shows up not knowing who he is, how he got there, or what happened to him. Isabel is the only one who sees him. Starting from the first time he came into the room (which is her room..awkward am I right?) all the way through out the book. But anyways he appears and only Isabel sees him. Tripp can't see him It was a great book! This book opens up beginning with Isabel and her best friend Tripp doing a spell. (witchcraft) Tripp does a spell making a ghost named Marc(aka Marco) appear in the room. He shows up not knowing who he is, how he got there, or what happened to him. Isabel is the only one who sees him. Starting from the first time he came into the room (which is her room..awkward am I right?) all the way through out the book. But anyways he appears and only Isabel sees him. Tripp can't see him actually no one can but her. And as the book goes on Marc, Tripp, and Isabel try to piece everything together on who he is and why he's there. I thought Tripp was a great character. Usually sidekicks are pretty useless, but in her case she was pretty useful. Although she did have a part in why he was there. I adored Marc. I loved the way he was written and I loved the way he acted. He was amazingly entertaining. I wasn't ever bored when reading about him. In fact I wanted to know more about him. He was my absolute favorite character throughout the book. Although I wish he would've made a move towards Isabel XD. The only thing lacking for me was the romance. There isn't exactly any, which got me a bit sad. I love reading paranormal books with at least a pinch of romance. Also I thought somethings they said weren't really things a teen would say. Some were most likely what adults would say, but then again it was also good. It was half and half adult and teen dialogue. But other than that it's a great short read. Isabel's best friend Tripp is always getting into something new. Her grandmother Alora, has a New Age shop, and right now, Tripp's interest is witchcraft. One night while Tripp is practicing "witchcraft" at Isabel's house, Isabel feels as though someone is watching them. As Tripp finishes her summoning spell, someone falls into Isabel's lap. The problem? Only Isabel can see this someone, and worse, he doesn't even know that he's a ghost. On top of THAT, he doesn't know who he is, or how he ended up as a ghost at all. With the help of Alora, an angel named Uriel, and a 16th century Irish stableboy named Finnegan, Isabel and Tripp must find out what happened to the ghost in order to send him on. This was a rather cute, fun read. If not for a spot or two of cursing, I would even have said it would make a good middle reader. There were some spots of funny, and even a little bit of romance, as well as the mystery behind how the ghost became a ghost in the first place. "Quest?" Isabel said after Alora has channeled Uriel. "I'm supposed to go with the ghost, uh, Marc, on a quest? What am I, Sancho Panza to his Don Quixote?" Adding insult to injury, his sister had walked through him twice while she'd kicked Isabel out the door. He hated it when the living did that to him. Girl vs Ghost was a fun, quick read. I enjoyed the story, the development of the characters, and the creative ideas. I particularly liked the imaginative details like the "low spirits" at the high school and the girls' visit to the grandmother's shop. The plot was what hooked me, though. It twisted and turned from the first line to the last, genuinely surprising me several times. The story is really creative, and alternated nicely between humor and action. I'm looking forward to the second and th Girl vs Ghost was a fun, quick read. I enjoyed the story, the development of the characters, and the creative ideas. I particularly liked the imaginative details like the "low spirits" at the high school and the girls' visit to the grandmother's shop. The plot was what hooked me, though. It twisted and turned from the first line to the last, genuinely surprising me several times. The story is really creative, and alternated nicely between humor and action. I'm looking forward to the second and third books in the trilogy to see where the story goes. Girl vs Ghost is a cute teen read. In all honesty the two best friends, Isabel and Tripp, reminded me of my best friend and I in high school. We were always up for what the other was doing. Of course neither of us got a hot ghost attached to us as part of the deal. The first half of the book was very slow moving. The Story really begins when the girls think they have discovered who killed Marc (the Ghost). It was intriguing to figure this mystery out. This is the point were Girl vs Ghost really picks up. I enjoyed reading about Isabel and Tripp, it was fun to see them getting themselves in and out of trouble. As a whole this was a fun read. The ending was a bit abrupt, but this is a trilogy. I would like to see what the authors have next for these characters and will be on the look out for the next book. This is a well-paced, interesting ghost story geared for a younger audience. It's got some humor, some action, and a mystery surrounding the "ghost" of the title. The cast of characters is wide, and I hope we revisit more of them in subsequent books, but the ones we follow most closely are likable and have interesting back stories. I'm looking forward to reading the next! This book was a Goodreads First Reads Win by a friend of mine. I was happy that he passed this forward to me. This was an enjoyable read for all age groups. This book will appeal to female teens. The characters were interesting which is a big plus in adding books to this trilogy. I always really love ghost stories, and this book did not let me down! Girl vs. Ghost is well written, with a fast paced story that starts with a bang! Kate McMurry and Marie August make an awesome writing team! I can't wait to see where the next book is this trilogy takes me! I gave this book to my niece in Kansas City and she just loved it. She was pretty good and she really liked the story and she commented on it wasn't too long. Funny, sweet young adult novel. A funny, sweet romantic comedy with a paranormal twist. Girl vs Ghost is an excellent first novel for a pair of new writers. Isabel Lindley is an attention neglected sixteen-year-old whose sole focus is her studies to become a doctor. The main distraction in her life is her zany best friend Tripp who picks up new interests like furniture picks up dust. Every time Tripp develops a new interest it becomes the sole focus of her life and she drags Isabel into it too. Tripp’s current focus is magic, but when she cons Isabel into sitting in on a summoning spell this go drastically wrong and Isabel ends up linked to a ghost who didn’t know he was dead and that only she can see. Since he’s connected to her by an invisible five foot leash she can’t get away from him and his presence doesn’t fit into her well ordered and driven life. Marco Davalos thought he was dreaming, watching the girls chant on the floor, that is until he winds up in the middle of their circle not remembering who he is or how he got there. Now Isabel, Trip and Marco has to work together to figure out the answers to the questions of his past before his past catches up to them. Okay first I’ll say this was really more of a 3.5 stars, it was a fast and enjoyable read. The main problem was there was no build for the story. What I mean by this is we don’t enter to meet the girls or learn about them before they start a spell. We open to the spell occurring and Marc showing up. Instead of a struggle to learn who he is, Tripp’s grandma announces his name the day after he arrives in a summoning. Everything basically falls into the characters lap and very little time is left to set the scene or add description. I know I’m a stickler for too much description, but for once I’m saying there’s really not enough. And I actually think it’s too fast paced because the authors aren’t allowing the time to character struggle and strife. They want us to acknowledge the two characters have feelings for each other by the end of the book but they’ve rushed through the story so quickly that you don’t see any reason why. The characters aren’t tied together long enough to be much more than strangers. For the most part the idea of the plot is really interesting, the characters all have some great potential, but the story is just so rushed that nothing rises to meet its full potential in this novel. Also there were a couple of things I found a little hard to believe. They’re all supposed to be attending the same private school, now I attended public school so I don’t know firsthand, but my thoughts are most high school people are paying tuition for are fairly small because of the tuitions. The likelihood that the two girls at sixteen wouldn’t know the two boys that are seventeen just doesn’t seem likely to me. I know there was something else, but at the moment it escapes my mind so we’ll just go with that and say that a couple other things were hard to believe as well. Additionally while I know this is a young adult novel, since it’s not a graphic novel and the protagonists are sixteen, illustrations really weren’t needed and are on the distracting side. Rather than a comic scene I’d rather that space had been used to expand upon all the interesting elements being brought into this story instead of rushing like a race to the finish line. I received Ghost vs Ghost as a First Reads win and was very hopeful based on the premise of it -- especially since the majority of the books I read are YA. Unfortunately, I was extremely disappointed with the novel and couldn't even finish it, regardless of how hard I tried. The main characters, Isabel and Tripp, were beyond obnoxious. I understand that author Kate McMurry was going for a feisty female lead with Isabel, but there is a fine line between having a feisty independent lead, and a rud I received Ghost vs Ghost as a First Reads win and was very hopeful based on the premise of it -- especially since the majority of the books I read are YA. Unfortunately, I was extremely disappointed with the novel and couldn't even finish it, regardless of how hard I tried. The main characters, Isabel and Tripp, were beyond obnoxious. I understand that author Kate McMurry was going for a feisty female lead with Isabel, but there is a fine line between having a feisty independent lead, and a rude, self-absorbed one. McMurry consistently made it a point to remind us of how Isabel has movie star looks, is smart and independent. We get it, no need to continuously remind us. Isabel doesn't even come off as humble when acknowledging these facts. Tripp is just as bad. She is so ignorant of her own weaknesses that she is utterly rude to others, especially her "rival" Parker Hamilton. He has every right to be angry, yet her arrogance gets in the way and she fails to see that she is the problem -- not him. Tripp's annoying personality only got worse as the book continued. I personally don't even think she's that good of a friend since she left Isabel on her own to deal with the ghost and forgot to bother looking into it once she got home to her brothers. Also, I was not a fan of much of the dialogue. I understand the ghost Finnegan had an accent, but was it really necessary to write it out? I think it would have been better to simply say he had an accent then let the reader's imagination take flight. I also didn't know what to think of the excessive use of Spanish dialogue. At times I couldn't help but wonder if Hispanic readers would take offense, because it really seemed like McMurry was stereotyping Hispanics and giving readers of other nationalities inaccurate interpretations of how they act. I understand Marco, the ghost, is Hispanic, but was it necessary to at times use Spanish curse words or have him use Spanish dialogue? Once again, I get it, he's Hispanic -- no need to keep reminding us. Even when we got to meet his family the grandma kept talking in Spanish and I don't see how that added to the novel whatsoever. I just feel like that really took away from the book a great deal. The artwork itself is very juvenile and had I seen this book in the bookstore, I never would have picked it up. I didn't like the artwork inside the book either. For once, the bad artwork matched the bad writing. Isabel and Tripp have been friends since 4th grade. Despite Tripp's constant stream of new and different hobbies Isabel has stuck through them all with Tripp and even enjoyed a few. But, when Tripp begins to dapple in witchcraft and summoning Isabel has decided this isn't one that she would want to partake in, especially when she keeps having an eerie feeling that someone is watching them as Tripp does her seances. But, Isabel sticks it out and holds her candle throughout the rituals to pacify T Isabel and Tripp have been friends since 4th grade. Despite Tripp's constant stream of new and different hobbies Isabel has stuck through them all with Tripp and even enjoyed a few. But, when Tripp begins to dapple in witchcraft and summoning Isabel has decided this isn't one that she would want to partake in, especially when she keeps having an eerie feeling that someone is watching them as Tripp does her seances. But, Isabel sticks it out and holds her candle throughout the rituals to pacify Tripp. Not really expecting anything to happen during Tripp's seances, Isabel is stunned when a guy falls from the sky and into there salt circle. She is even more stunned when Tripp cannot see or hear this strange guy in her room and then proclaims he must be a ghost! Not only is Isabel the only that can see and hear this ghost, but she is also tethered to him. Literally tethered by a glowing orange rope no longer than 5ft. And, not only that but the ghost has no memory of who is he, or when he died. All Isabel wants is to unleash herself from this ghost, before it ruins her life! But Tripp doesn't think it is all the bad and wants to figure out who this ghost is and help him out. So, in order for Isabel to be freed of him she must go on a quest to find out what happened to him and why he is tethered to her! The beginning starts a little slow for me, and it is a bit confusing. But over half way through the book the pieces began to fall together and make more sense. Also the story began to pick up the pace and I really started to enjoy the book. Things aren't the way the seemed as the story continues on. I think Tripp and Isabel are supposed to be 17? But, they come across much younger in my opinion. For instance, when they are in the thick of things trying to save Marc the ghost, Tripp tell Isabel that she has to play the part as Marc's girlfriend to find out more information. But, Isabel's first reaction to that situation is "Eeuuw" which seems a little juvenile of a response, especially for a girl in advance placement classes. And some of the dialogue is a little corny at times but I still enjoyed it. There are also illustrations at the beginning of each chapter which gives you a glimpse of what is going to happen in the following chapter. When Isabel's best friend, Tripp, wrangles her into helping with a little bit of spell casting the last thing she expects is to wind up with a handsome guy practically plopped into her lap. She especially doesn't expect it to be a ghost with a bad case of amnesia that only she can see. Complicating matters is the psychic rope binding him to her by a handful of feet. If Isabel wants to get rid of her haunting companion she'll have to unearth the mystery of who he is, how he died and just why he's tied to her anyway! I wanted to like GIRL VS GHOST much more than I did. I love the originality of the premise and I really liked Marie's webcomic of the first chapter. Unfortunately this story is excrutiatingly tame aside from a few uses of the B-word and as an adult reader who enjoys grittier teen reads it just didn't quite work for me as a reader. On the flip-side I think this would be a great one for the tween to early teen set who might not be ready for meatier fare. When I can pin my almost-13-year-old stepkid down I'm going to have to see what she thinks of it because I think this is right up her alley. The actual storyline is fresh but flows from conflict to conflict with the resolutions coming a little too easily. I occasionally felt like I wasn't getting enough insight into why each character was motivated, more attention to character development would have pleased me. Honestly I didn't like any of the characters perhaps in part because of the aforementioned lack of development but primarily as a result of odd behavior/reactions that just didn't feel natural. The story ended on a very flat note and the first word that popped into my head was 'lackluster'. Keeping all of my personal preferences in mind GIRL VS GHOST fits its publisher's intended demographic perfectly. The 12-16 age range reader in search of clean, humorous paranormal titles will probably love this series. Adult readers, unless that's what you're looking for this just won't do it for you. Girl vs. Ghost is the first in the Misdirected Magic series by the mother-daughter writing duo of Kate McMurry and Marie August. I am a sucker for any book dealing with magic as a theme, and was excited to see one that had both magic and ghosts and much mystery. What I found the most interesting about this book was the writing style. It was told from the point of view of Isabel and the language style was very much that of a teenager. It read like a teenager and that definitely added to the overa Girl vs. Ghost is the first in the Misdirected Magic series by the mother-daughter writing duo of Kate McMurry and Marie August. I am a sucker for any book dealing with magic as a theme, and was excited to see one that had both magic and ghosts and much mystery. What I found the most interesting about this book was the writing style. It was told from the point of view of Isabel and the language style was very much that of a teenager. It read like a teenager and that definitely added to the overall feel of the story and made you, as the reader, feel more of a part of the story. The characters were fabulous, very well-developed. I loved the humorous play that would take place between Isabel and Tripp. The addition of a beautifully gorgeous male ghost who seemingly suffers from post-death amnesia just adds to the plot. While there was a lot of humor, most of which I thought was quite clever, the more serious, emotional scenes didn't feel as serious or emotional as I think they were intended to be. There were a few notable exceptions to that, however, and that kept me turning the pages. I loved the premise of the story, but there were various parts that felt, as I read them, that they were going to be the building blocks for twists or subplots further in the story. Instead, they never came to fruition, leaving me to feel as if I was missing some things, albeit minor ones. This is a book that the saying about not judging a book by it's cover most definitely applies. I admit that a stunning cover is frequently the selling point for me when testing unknown waters, sometimes more than the blurb on the back. I really didn't like this cover, nor the inner art. But the book was definitely better than the initial impression I got with the cover. This review has been hidden because it contains spoilers. To view it, click here. I received this free from Goodreads Giveaways. This was a fast and fun read. I feel the Mother/Daughter author team of Kate McCurry and Marie August have potential in the young adult/teen field. The story stays on track throughout, characterization is pretty good, though I felt Tripp was the most complete character, even though she was not the main this time. I believe the next book focuses on her. The main character Isabel is not as well done in my opinion, she starts out with an unreasonable le I received this free from Goodreads Giveaways. This was a fast and fun read. I feel the Mother/Daughter author team of Kate McCurry and Marie August have potential in the young adult/teen field. The story stays on track throughout, characterization is pretty good, though I felt Tripp was the most complete character, even though she was not the main this time. I believe the next book focuses on her. The main character Isabel is not as well done in my opinion, she starts out with an unreasonable level of dislike for the ghost that is tied to her, and ends abruptly in love with him, granted after a life-threatening adventure to bring him back to his body, which would tend to make you emotional, but that aspect didn't seem to have enough build up to me. The storyline is fun, I enjoyed it. Isabel is only doing a favor for her witchcraft interested friend Tripp, and ends up with a ghost bonded to her that cannot travel more than a few feet away. He doesn't remember who he is, or how he died and needs their help to find out. Isabel is less than thrilled to put it mildly and just wants him gone! Tripp on the other hand is excited that her spell worked, if not completely truthful about what it was for, she meant well, and that makes it all okay, right? As it turns out, witchcraft is more complicated than she realized, and a lot more proprietary than she could have guessed, having "borrowed" what she believed was an unwanted spellbook, and unwittingly engineering the whole mess they find themselves in by her selfishness. It's a much worse problem than Isabel having a ghost tied to her, as Tripp's spell conflicted with Parker's, who is the spellbook's rightful heir, and released a malevolent demon into the world. I have to admit that I was a little torn as to how to rate this book. The book blurb made it seem as if it was a teen read. Once I started reading it, however, the tone of the book seemed to gravitate more towards a far younger audience, which was accentuated by the presence of drawings at the beginning of each chapter. The reason I make a point of mentioning this is because books for younger readers tend to be written a little differently than books specifically aimed towards teens, and some of I have to admit that I was a little torn as to how to rate this book. The book blurb made it seem as if it was a teen read. Once I started reading it, however, the tone of the book seemed to gravitate more towards a far younger audience, which was accentuated by the presence of drawings at the beginning of each chapter. The reason I make a point of mentioning this is because books for younger readers tend to be written a little differently than books specifically aimed towards teens, and some of my gripes with this book wouldn't be as applicable in that case. I think that McMurry just tried a little too hard to appeal to a wide audience here, which made the book a little confusing to read. For a teen book this is a little bland, but I can honestly see younger readers getting into this read. If not for the occasional swear word and slight reference to sexuality (nothing bad, I assure you), this would actually be a very good children's book for agest 9-12. There's a bit of danger, but nothing so over the top that parents would really worry about it.